outputs a dezipped async control signal. outputs dezipped async and sync control signals. 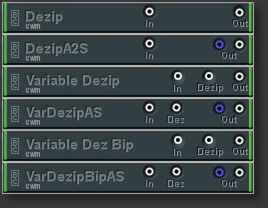 outputs variably dezipped async unipolar control signals. outputs var.dezipped async & sync unipolar contr.signals. outputs variably dezipped async bipolar control signals. outputs var.dezipped async & sync bipolar contr. signals. incoming control data can be manipulated by using a freely editable curve (can be saved/recalled via Preset List). Multi LFO with inbuilt Clock divider. Lfo rate control either by ClockDivider setting (connect MidiClock Frequency), Manual control (Fader) setting, or external Frequency. 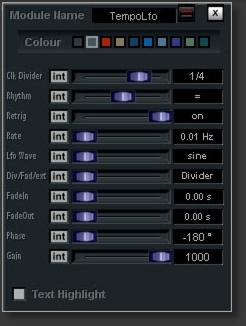 Sine LFO with async rate and gain controls. Range 0 to 214783647. Max becomes 0, and vice versa. outputs gate messages at a random rate. determines the direction of movement of incoming signals. If incoming signal's direction is 'down', o1 is up, o2 is low. stores/recalls 8 x 24 different values. 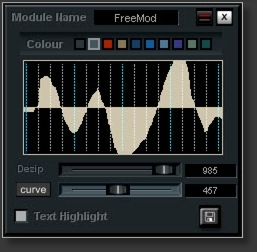 modifies incoming freq signal by coarse and fine tuning controls. outputs note numbers of connected Midi input.